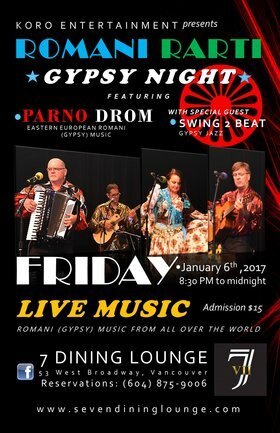 Every first Friday of each month starting January 6th, 2017 we welcome you to our Romani Rarti ( Gypsy Night ) at the 7 Dining Lounge , 53 West Broadway in Vancouver. We will have a main music group PARNO DROM performing Eastern European Romani (Gypsy) music and we will have a guest performers or groups performing Romani (Gypsy) music from all over the world. Each month different guest performers. Also, at the 7 Dining Lounge you will find delicious west-coast cuisine fused with Asian and Italian flare, with ingredients sourced fresh daily from the local suppliers and an vast drink list.